The Raster is a digital delay with a pitch shifter integrated into the feedback loop. It delivers a wide range of sounds including harmonized delays, reverse delays, chorus, arpeggios, infinite descents, chaotic self-oscillation, and continuously evolving soundscapes. covers a wide range from slapback delay to noisy, textured infinite feedback loops. Knob responses are carefully tuned for exploration of self-oscillation and feedback on the verge of blowing up. or shift once and remain at that pitch. Two reverse delay modes can be used for reverse solos or with pitch shifting for crystal echoes. delays that distort and break apart. Capable of extreme sonic mayhem, it can also be used with restraint to add unique character to your sound. 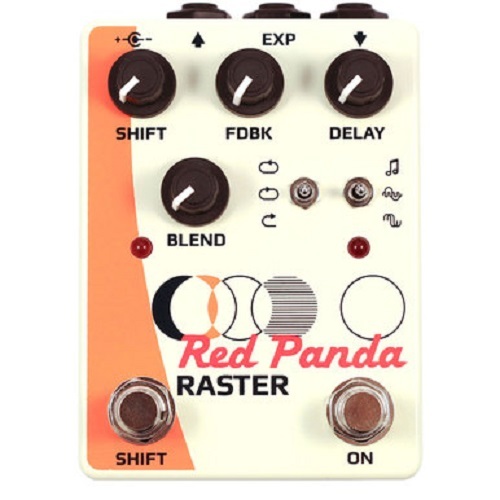 The Red Panda Raster is Made in Detroit, USA. Dimensions: 4.4" x 3.3" x 2.4"